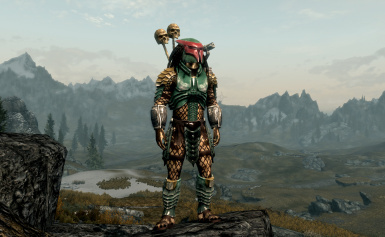 "Blazze69" is granted permission to post a "CBBE and alternative body mod" work Along with "compatibility mod" work which may include much BSA and ESP file content with edits. 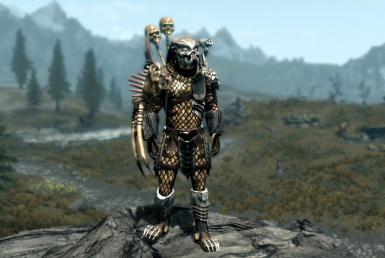 Thanks to the community on the message boards who've play tested, made suggestions, given me advice, and who in general, are big fans of Predator mods like I am. I am grateful for your patience, and listen and take to heart all your thoughts. 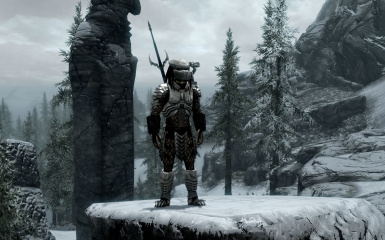 Thanks to everyone who posted Tutorials here on the Skyrim Nexus. At one point I literally nearly read EVERY single one of them to learn how to create this mod and contribute back to the community. So if you wrote or filmed one - Thank You for your hard work, and for enabling others to give back to the community. 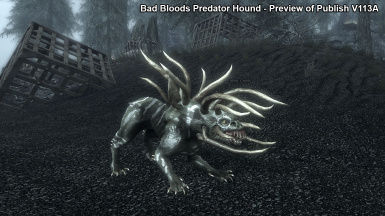 My Thanks to previous developers who's made Predators in previous Bethesda games - its you who have inspired me to step up to the plate and do this one for Skyrim. Credits to all the men and women over the past 25 years who've created Movie, Games, Toys, Comics and Art with Predators in them. 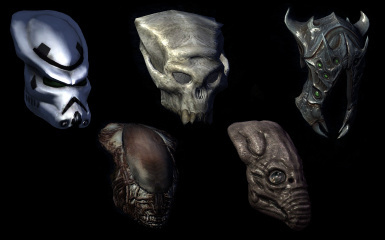 Naturally without them, none of these creature concepts and lore would exist. 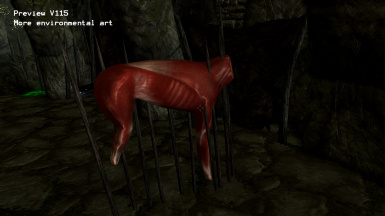 All models were built by me, and or were Bethesda assets reskinned. 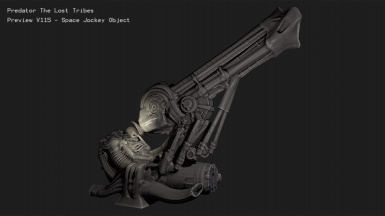 I have not used other game art, nor will I accept any models pulled from other games. So even if you mean well, please don't offer them to me. Thanks. 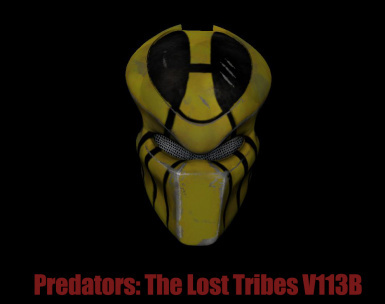 Predators: The Lost Tribes. 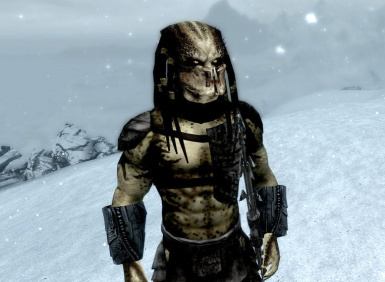 Yautja descendants stranded in Skyrim for thousands of years, hunt on the edges of Tamriel, and live on the fringes of the harsh Nord wilderness. 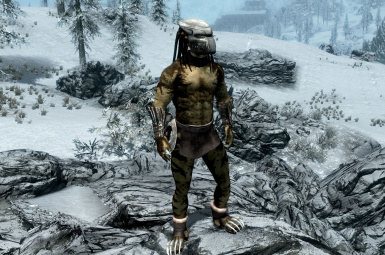 Play as a Predator, or as a standard Skyrim race. 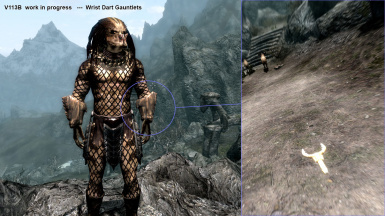 Rediscover Yautja artifacts, weapons and armor lost in Skyrim. 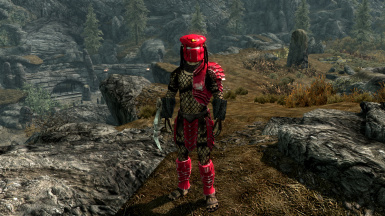 You can mix and match a lot of clothing and armor in Skyrim to create your own character and roleplay story. 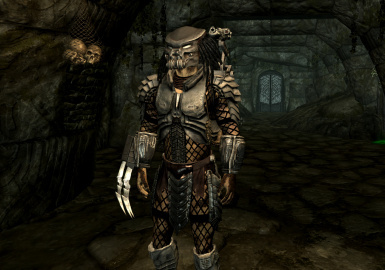 Predators have stashed cultural gear in hidden locations. 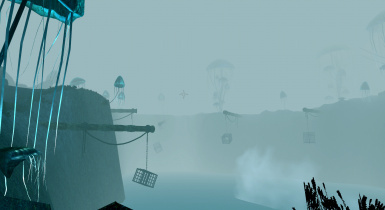 Drop pods are concealed or abandoned in the landscape. 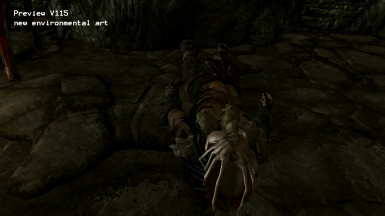 A Book found in the Helgen Keep Tutorial, outside of Helgen's keep and Dragonsbane castle will start you off and add points to your Map where camps of Yautja have settled. 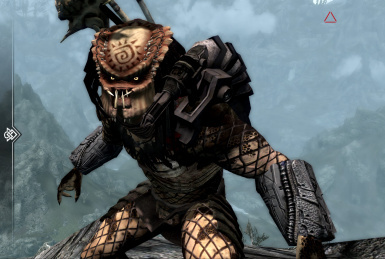 Beware, the Berserkers, Savages, and Badblood Yautja are hostile headhunters and not friendly to outsiders. 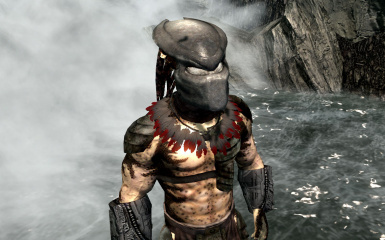 Fear not, civilized Yautja live far to the North East. 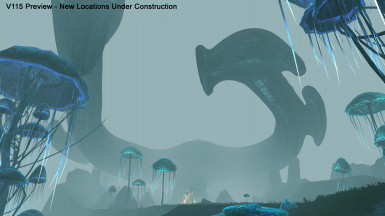 However, Yautja have also brought deadly Xenomorph species to the land as well and have established training temples and concealed communities hidden about the land. - Remove/Delete any previous predator .BSA and .ESP files. - Then drop all the new predator files into your Data folder. 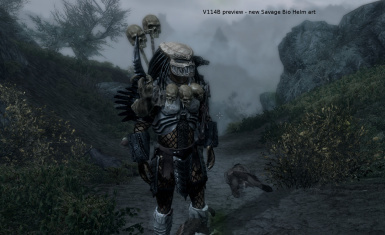 - Set the Predator Mod files to load LAST at the bottom of your mod list. 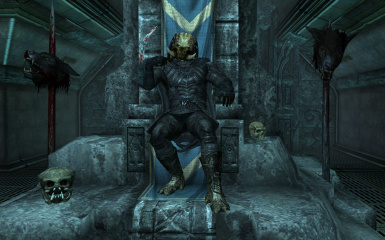 - Your Skyrim must be an updated/patched to the latest "official" version. 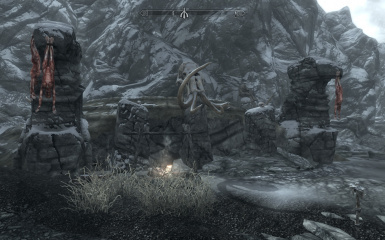 Lots O' Skulls ( a fantastic trophy mod ) http://www.nexusmods.com/skyrim/mods/77899/? 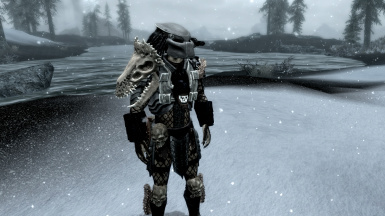 Predators - The Lost Tribes Patches-Cloaks of Skyrim http://www.nexusmods.com/skyrim/mods/77177/? 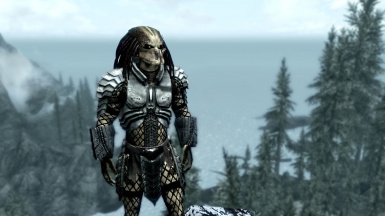 Predators - The Lost Tribes - Daedric Cloaks http://www.nexusmods.com/skyrim/mods/83538/? 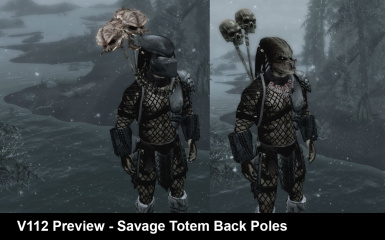 Predators - The Lost Tribes Patches-Frostfall http://www.nexusmods.com/skyrim/mods/77419/? 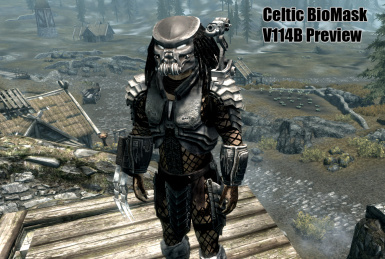 Predators - The Lost Tribes Patches-Illustrious HDT Cloaks of Skyrim http://www.nexusmods.com/skyrim/mods/77167/? 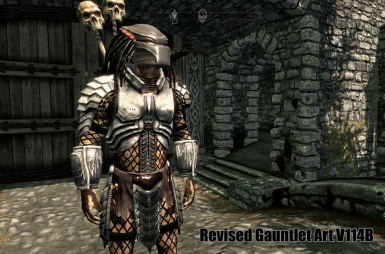 Predator Compatible - Immersive Armors by DrifterDQ http://www.nexusmods.com/skyrim/mods/60790/? 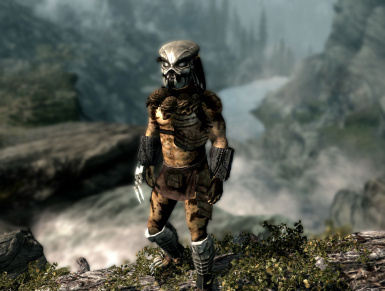 Predator shout and sounds by MurdermiesteR http://www.nexusmods.com/skyrim/mods/28531/? 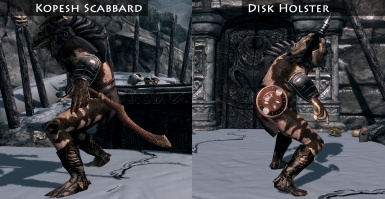 Predator Legends-Broken Tusk blade by MurdermiesteR http://www.nexusmods.com/skyrim/mods/66427/? 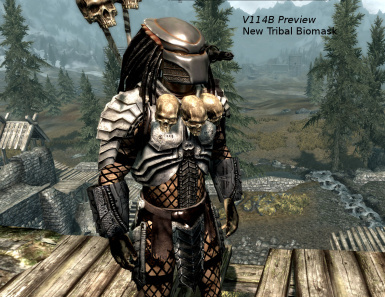 Predator Yautja Burner by MurdermiesteR http://www.nexusmods.com/skyrim/mods/41343/? 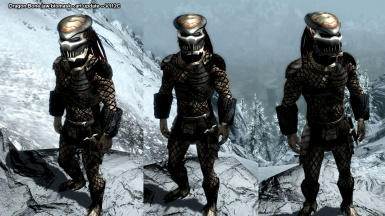 Dragonborn armor compatibility mods for Predators- TLT by Dnxyken http://www.nexusmods.com/skyrim/mods/30741/? 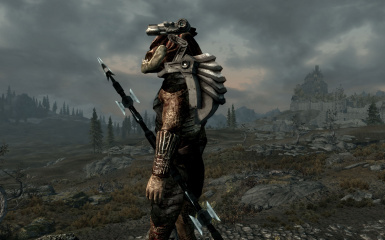 Renza's Race Compatibility Patch for Predators - This 3rd party patch might fix werewolf /vampire and race compatibility issues - requires Dawnguard and RaceCompataibilty MOD. 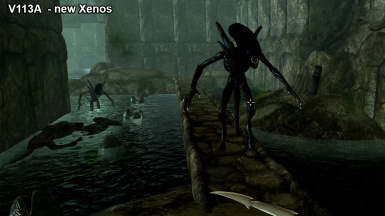 This Race compatibility mod ===> http://www.nexusmods.com/skyrim/mods/24168/? 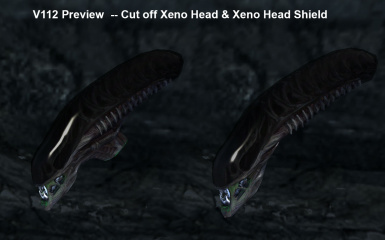 Yautja and Xenos are extremely tough and dangerous and are not for the low-level character. Engage them with caution, cunning, and maybe a few healing potions. 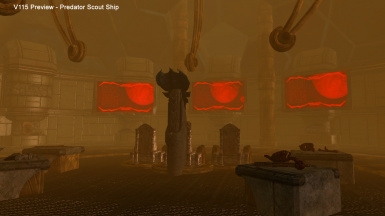 Yautja covet the weapons, armor and relics their ancestors brought here from the stars. 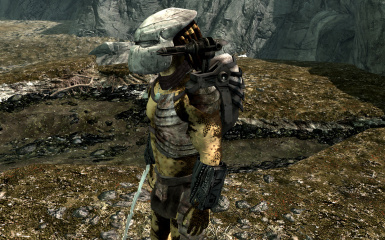 Trading with them, finding their hidden drop pod stashes, or defeating them in combat is the greatest source for finding Yautja cultural items. There are 3 'races' with both Male and Female genders. 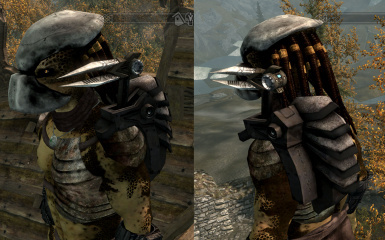 You can set skin color tinting and there are many dreadlocks styles you can choose from. 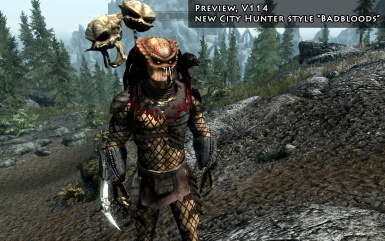 This mod adds a large selection of unique Predator Culture. 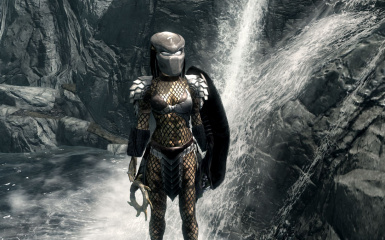 Weapons, Armor, different boots and sandals, gauntlets, necklaces, trophies and over 30 Predator Bio-Mask designs. 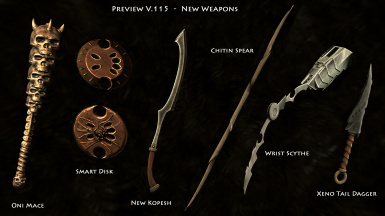 Coal forges and stone grind wheels are not enough to improve Yautja weapons - special kits will be made so you can upgrade those. 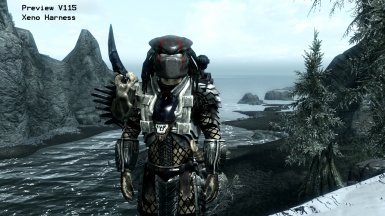 You will find Yautja armor upgrades kits that will allow you to improve the strange metals the predator items are made from. 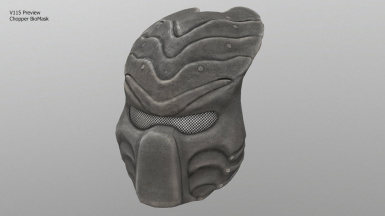 There are also Upgrades to predator cloaking devices that will improve your Sneak capability. Over 55 Yautja Weapons to use! 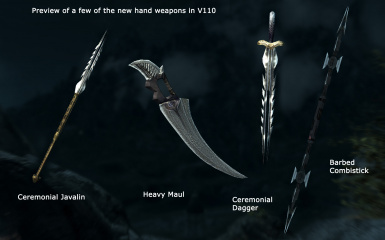 Savage Wrist Blades (mammoth tusk weapons)-- dagger or sword?? 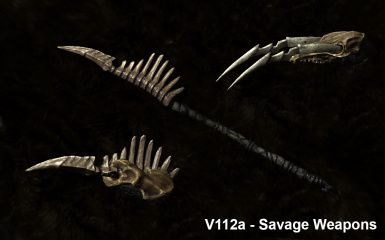 Savage Wolf Skull Wrist Blades (Left & Right hand versions)-- dagger or sword?? 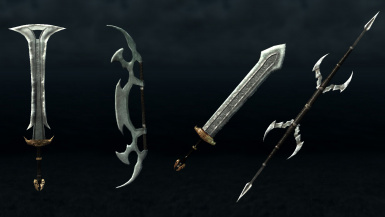 Wrist blade weapons - If you put a left wrist blade into a right hand slot (or right in a left slot)- they will attach facing backward! 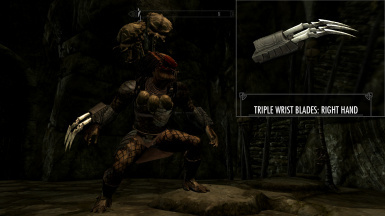 So put right-handed wrist weapons on the right hand, left in the left. Simple enough. Swords, combi sticks, Glaive, disk weapons and even plasma guns don't care what hand you hold them in. 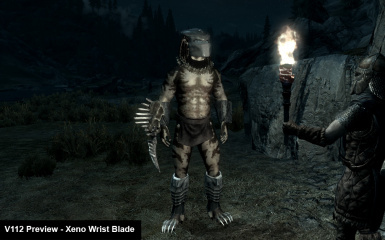 Wrist mounted weapons will work correctly with vanilla Skyrim animations. 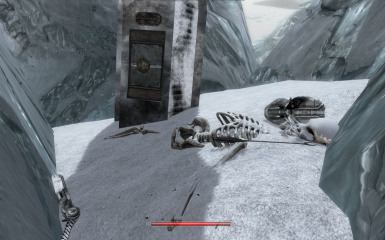 If you find them occasionally flipping backward when you move - its a bug with the skeleton that was used in the Animation Mod you're running. 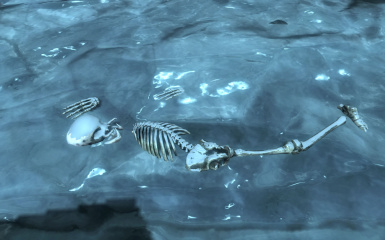 "FNISs Custom Skeleton Arm Bug patch" fixes such skeleton errors right up. 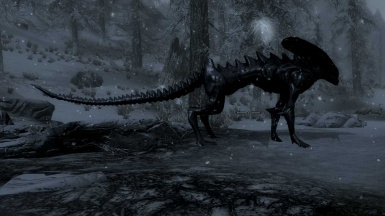 Predators are 100% resistant to Skyrim diseases. 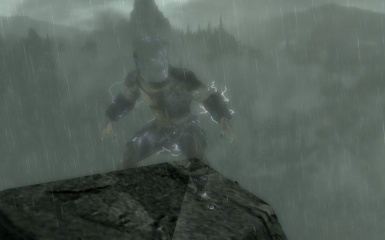 However - In Dawnguard you Can still transform in vampire lord after being bitten by Serana! 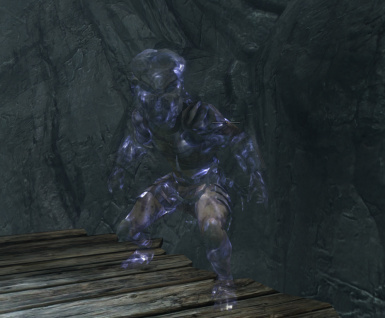 However you can not currently play/use the Brotherhood Werewolf ability with this new race. 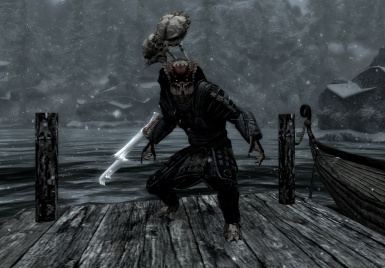 (issues with Skyrim's werewolf Scripts) So consider Vampire and Werewolf as unsupported by this race. 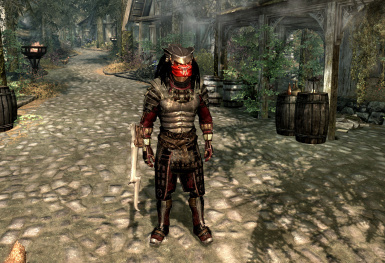 I have made some limited "Vampire" support - so some mods might be able to give additional vampire gameplay support for Yautja. 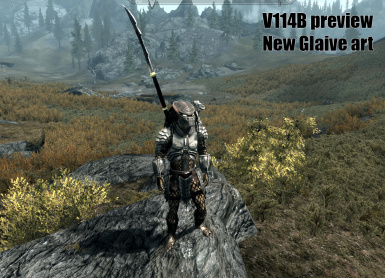 New special armor art in Dawnguard or Dragonborn will appear invisible. Those games have their own item lists. 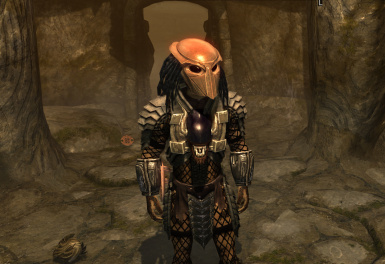 However - there are some 3rd party compatibility patches here on the Nexus others have made, so go search and see what you can find for 'Predators'. 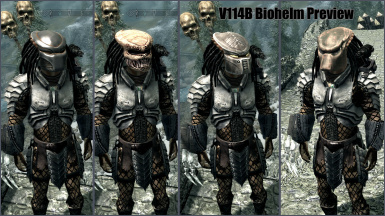 Currently, only Predators can wear Predator BioHelms in this mod. 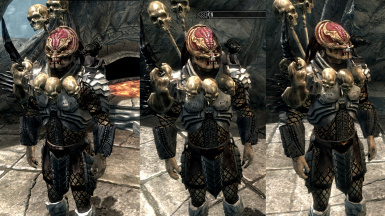 (the exception is the Falmer helm and destroyer biomask). 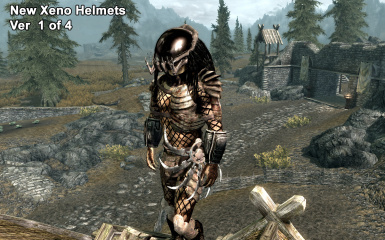 Yautja do not wear most vanilla Skyrim helmets because of their odd head shape.Eventually, I'll make more variations of biomask 3d models so more vanilla Skyrim races can wear the masks. SAVE your games! -- not just quick save. Be able to back it up if really bad bugs happen, or if updates make conflicts, or new quests or new things later you just want to revisit without starting over. I don't have a crew of a half-dozen game dev pros working on this - its just me and a few Modders from the Nexus community pitching in doing additional plugins. 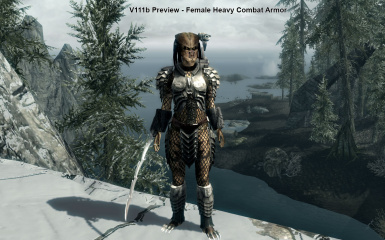 There is a Predators Race Compatibility Patch available on the downloads page that should take care of 3rd party mod armor, transformations, race quest compatibility issues and many other bugs Skyrim typically develops with New races. You do not need to run the patch - but be aware of issues that can occur. 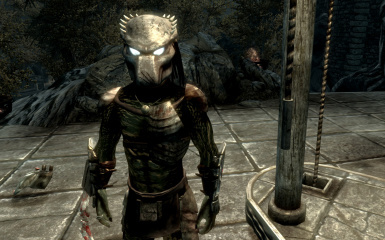 There are a few quests with dialogues that check for what vanilla Skyrim race you are. If you're not a vanilla race the quest hangs or just ends. 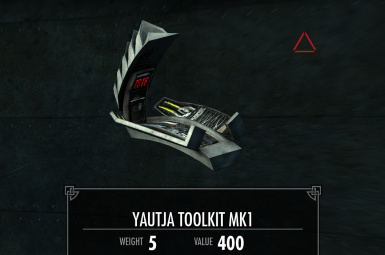 To fix this when encountered - simply redo that dialogue again but switch to a vanilla race - do the quest dialogue and then swap back to your Yautja race when the dialogue is done and rewards are all given etc. Werewolf quest - dialogue for Companions werewolf quest will also hang because of a quest race check for dialogue responses. 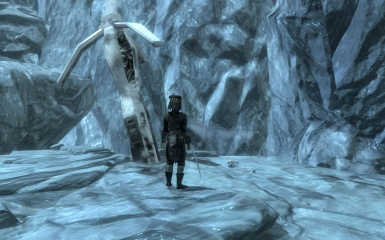 switch to a vanilla race temporarily to do the dialogue thin the cave. 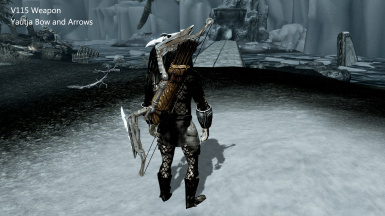 However I don't think Werewolf powers work anyway with Yautja - so best to skip this quest altogether if you can. The Wedding Bug (Fixed in V110B !!!) In old versions disgruntled Yautja would crash the wedding and attack the priest and guests. WTF you say - yeah apparently the temple priest was a friend of "thief faction" the Yautja hate. So it was, "kill on sight" time. 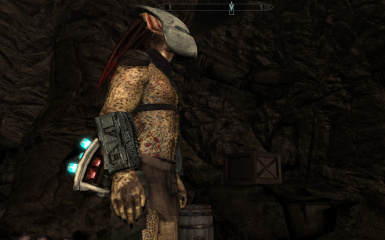 Followers NPCs - Yautja followers are a little buggy. Be warned. 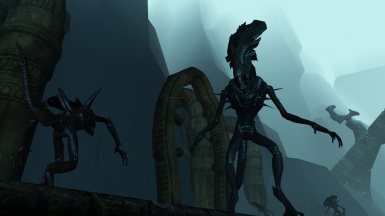 It's easy for Mod conflicts to occur with these guys.They can't walk into the Derelict ship or Destroyed Xeno Temple. (still working on that bug) When you exit these spaces - they'll be gone until you fast travel - they'll be back and by your side. Be warned. 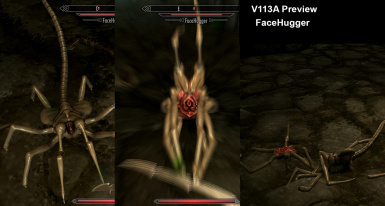 They can get really buggy if you're running a 3rd party mod that heavily modifies vanilla Skyrim follower/NPC behavior. They might not want to dismiss. So you'll have to experiment with them if you're not sure to see how it handles for you. I wasn't doing to do this follower stuff - but fans requested it so I relented and put it out for better or for worse. 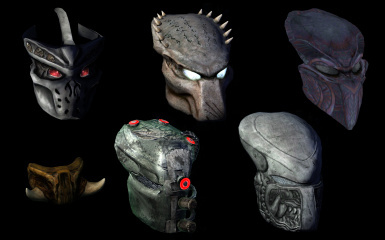 - Adjustments to many texture maps and many remade models. 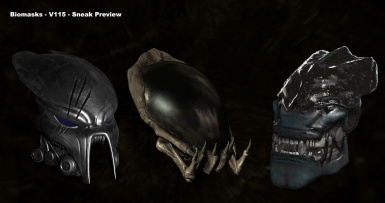 - The addition of new, Unique Bio masks, equipment and fixes to encounters. 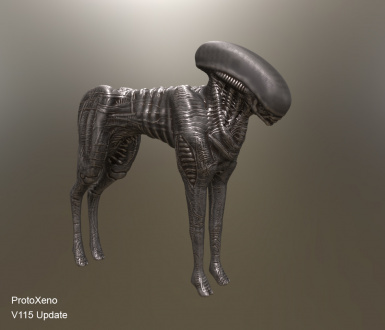 - New Xeno Textures and materials. - Created an additional PLUG IN - for JUMP height 2x and 4x choices. 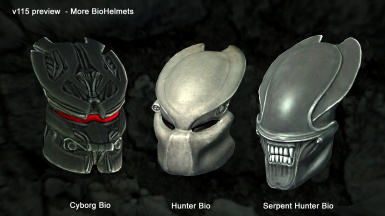 - more bio helmets wearable by vanilla races. New dense dreadlock styles for BadBloods. Classic Yautja - face piercings and old age horns. Getting started Faster - read on for Hints and Spoilers! 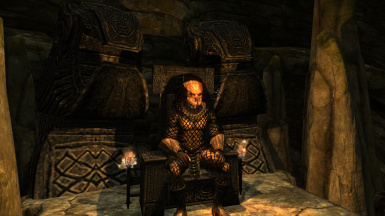 - There are Yautja books in wizard's desk at DragonsReach Castle, Helgen's keep dungeon, and in a drop pod outside of Helgen keep. These books give Map locations of many dangerous Yautja camps and abandoned drop pod sites. 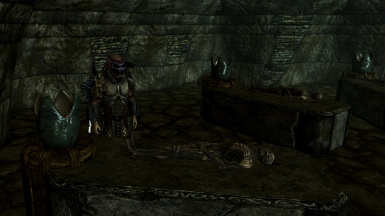 You can find the starter gear and a small Book in the Helgen keep dungeon. 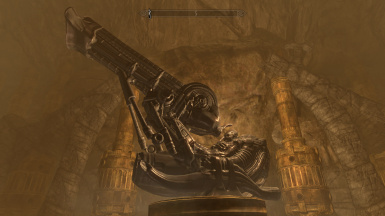 (the tutorial dungeon we all have to run at the start of the game) An imperial officer and a soldier are near a recently dug up dwemer chest in the storeroom that contains this and more Yautja treasure. Don't want to play the tutorial? 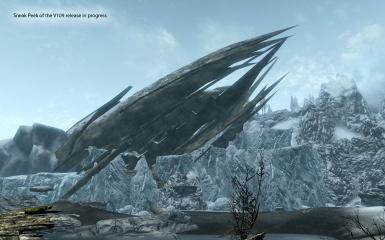 - that's understandable - so that's why - not far off the road that is the exit of the tutorial - there is a drop pod with starter gear and books that grant map waypoints in it. 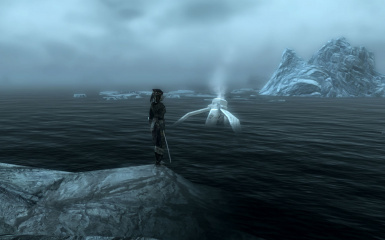 Additional Gear is hidden out in the icebergs and water East/ North East of the Solitude Lighthouse and randomly out in the water or stuck partially in the ice - probably barely visible. 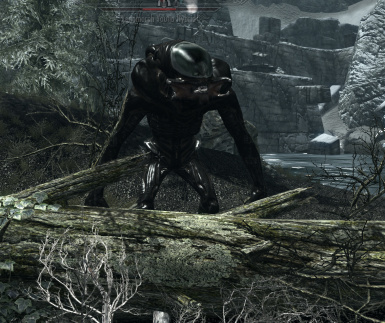 There is usually a drop pod in every Yautja Camp. 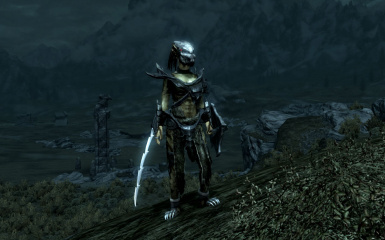 Sometimes random loot gear in DropPods is a repeat.When you are low level - you may have to sneak to get loot - Yautja are very powerful creatures that will kill low-level players. 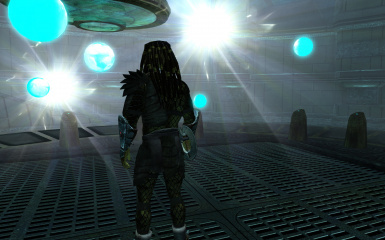 Many of the Predator camps and Xeno locations are given by wizard's Books about the Yautja. Find and read any of these books and 4-5 predator locations will be put on your map. 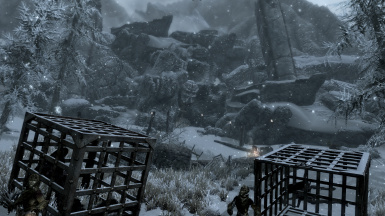 The Civilized (less hostile tribes) of Yautja live in the ruins of a Derelict ship - located to the far North East Shores of Skyrim. 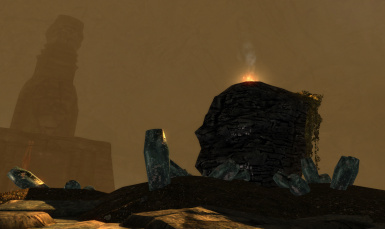 Locations of (just some of the) hostile NPC predator camps. 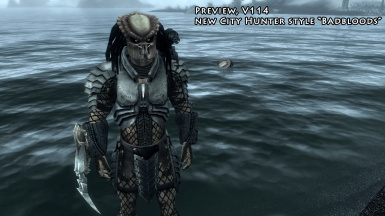 Beware they are very capable of killing a single low-level Yautja or stranger trespassing on sight. 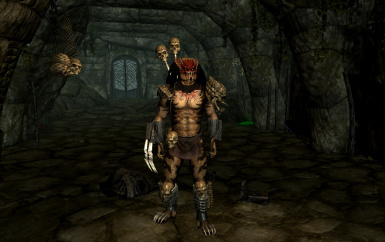 - Ysgramor's Tomb (North, North East shore) Savage cave dweller Yautja live here. Warning! They are particularly EVIL, deadly and fearless. 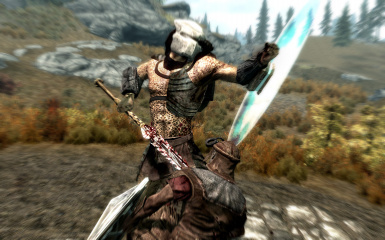 - Bad Blood Settlement - Extreme North West of all of Skyrim. Easy to find - many Yautja here - and just on the edge of the destroyed Xeno temple.